Journaling says: Right around when you were born foxes became uber trendy in fashion, decor, scrapbooking, and more. Foxes foxes everywhere! In 2013 a song went viral all about "what does the fox say?" Kids in your class sang it to you and you and Jane sing it for me. Too funny! How to: Trim 1/2" from the top of a gray polka dot paper layout background leaving the tearaway strip intact and put that at the top. Punch 1" circles from Amy Tangerine 6x6 paper pads and adhere them with pop dots across the layout. Add an epoxy border sticker, mini alphabet and foam stickers across the top to make the title. Place a "remember" chipboard sticker on the top right with a "this" sticker below. Adhere a square photo on the layout, slightly off-center. Place speech bubble wood veneer, chipboard, and die cuts around the photo and embellish with stickers and journaling. Stick a chipboard bow at the bottom of the photo. Stamp the date on the bottom right corner and drop black spray mist around the layout as shown. Journaling says: What are these silly and sweet faces you're making here dear Jane?! How to: Punch 1/2" squares from Dear Lizzy 6x6 paper pads, cut each square in half diagonally to make tons of triangles, then adhere them in 7 rows down the center of a blue patterned paper layout background. Sew diagonally across each row of triangles and leave the thread ends pretty long. Die cut three doilies from white cardstock and place them on the top left, middle right, and bottom left corners. Layer photos, fabric brads, epoxy stickers, accordion and fabric flowers, ribbon photo corners, and more, on each die cut doily as shown. Journal on a die cut card and tuck it under one of the doilies. 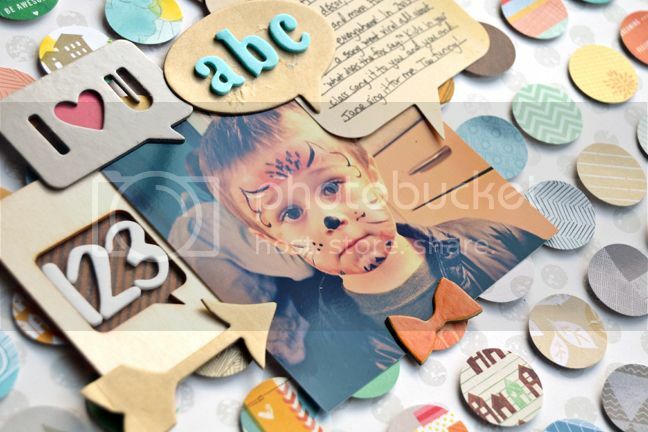 Make a title with chipboard and mini alphabet stickers under the middle photo. Stamp the date below the title and drop dark blue spray mist around the doilies. Scrap scrap scrap scrap scrap. I love scrapping! These are gorgeous!! I am LOVING how you always create the most AMAZING shapes for your backgrounds!!!!!!!!! I swear, you are the most creative scrapper in all of the land!!! 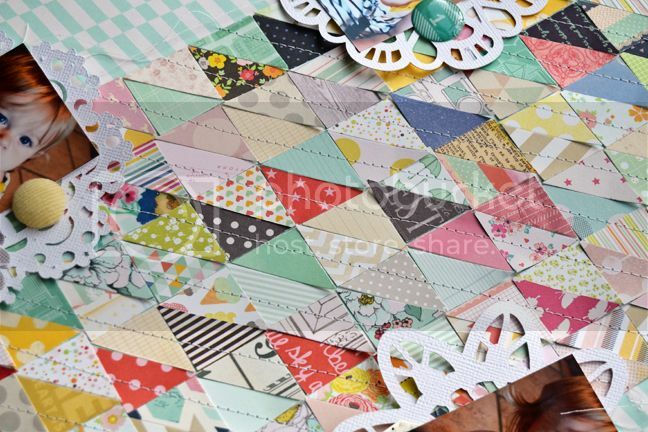 I love what you do with scraps and bits and pieces!!! I LOVE those papers by Amy Tangerine. They're gorgeous. And Fox is a door able. 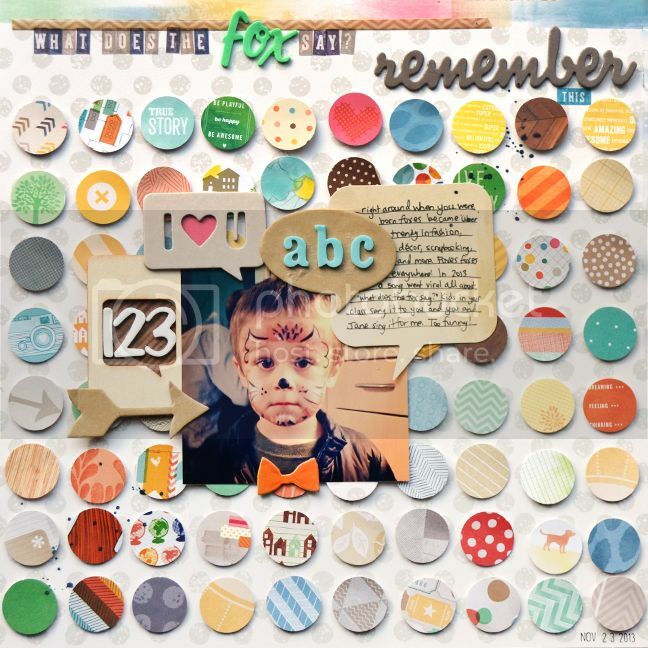 What doe YOUR Fox say?...well, I think he would say: "I have the BEST Scrapbooking Mom in the whole wide world!" And I would totally agree! Awesome use of the 6x6 paper pads, Paige!! 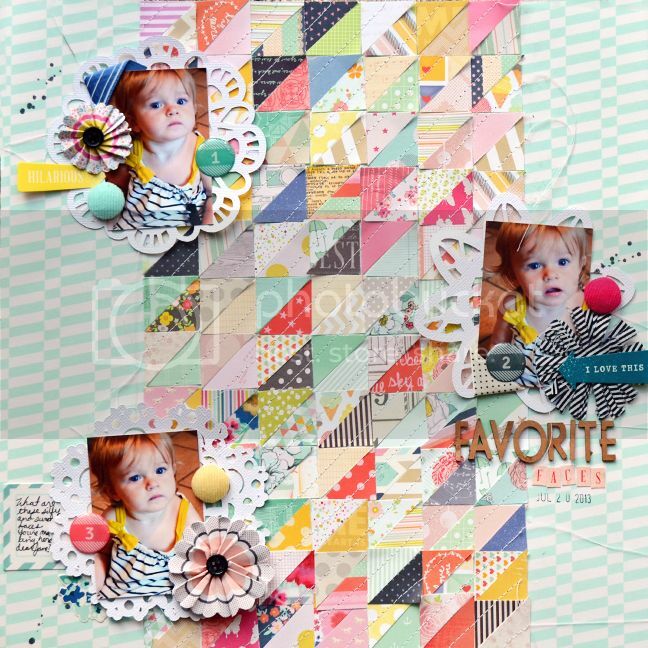 Love both of these cute layouts!